I had the pleasure of travelling to Antarctica and hopping aboard a One Ocean Expeditions ship to shoot an assignment for Canadian Geographic last February. It was my first time on the continent, and I knew I had to be prepared for whatever the infamously stormy Drake Passage might throw at us. The right gear is essential when I'm on assignment: the best moments are often fleeting, and If I'm preoccupied with being cold or wet, I could miss them. That's why I selected three Columbia items to take on this voyage: the Titanium OutDry Insulated Jacket, Titanium OutDry Gloves and a few baselayers. Here's my take. I had to take four flights to get to the launch point of the One Ocean Expeditions ship, my floating accomodation for the voyage, at King George Island, Antarctica. With that much time spent navigating airports, I wanted to pack light. A winter jacket can sometimes be a heavy, bulky item, but nowawdays there are some excellent down-filled jackets that pack small and weigh next to nothing. Columbia's Titanium OutDry Insulated Jacket is one of these. This 700-fill, responsibly-sourced down jacket was perfect for my two-week Antarctic adventure. Although the temperatures in the Antarctic Peninsula are not extremely cold at the end of February (summertime in the southern hemisphere), they do fluctuate quite a bit, ranging from -10 C to 5 C. These can be challenging conditions, but the jacket was breathable enough to keep me from overheating on long hikes and warm enough to keep me toasty on chilly mornings, and the waterproof OutDry construction and adjustable storm hood kept me dry in the sea spray on board. A set of weather-appropriate gloves are a must when I'm on cold-weather assignments. Columbia's Titanium OutDry gloves were great on the coldest days, but they were a bit too heavy for the warmer temperatures we sometimes experienced. When I needed them, they offered effective wind protection and stayed waterproof during long hikes, while the reinforced grip ensured I didn't lose a hiking pole. The soft, wicking fabric inside was a nice addition. Unfortunately, since these were so heavy duty, I couldn't use them to shoot. They're more like skiing gloves, and don't offer the dexterity needed for fine movements. Baselayers don't get enough love — they are so important in cold, wet environments. And this shirt and tights from Columbia were a must-have throughout my trip. They were breathable and had excellent wicking properties, and the four-way stretch fabric was very comfortable, even after eight hours of hopping on and off Zodiacs. 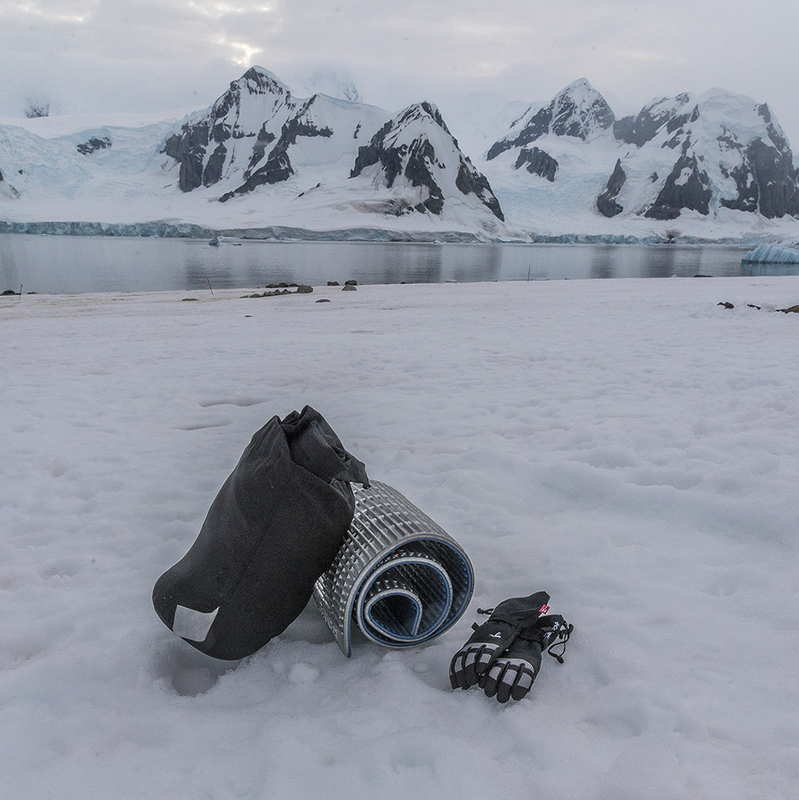 I was expecially happy to have them during an overnight camping experience on an Antarctic beach, armed with nothing more than a sleeping bag and a tarp.